Ellen Johnson Sirleaf, born October 29, 1938 in Monrovia, Liberia is the 24th and current President of Liberia. She served as Minister of Finance under President William Tolbert from 1979 until the 1980 coup d'état, after which she left Liberia and held senior positions at various financial institutions. She placed a distant second in the 1997 presidential election. Later, she was elected President in the 2005 presidential election and took office on 16 January 2006. Ellen Johnson Sirleaf, a native of Monrovia, Liberia, was a student of accounts and economics at the College of West Africa in Monrovia from 1948 to 1955. Around that same time, when she was seventeen years old, she married James Sirleaf. The couple had four sons before ultimately divorcing. Sirleaf later completed her education at the University of Colorado. She next studied at Harvard University from 1969 to 1971, where she earned her master's degree in public administration. After completing her education in the United States and returning to Liberia, Sirleaf worked as minister of finance from 1972 to 1973. But when the political climate in the early 1980s became too tumultuous, Sirleaf fled to Kenya, where she served as director of Citibank in Nairobi. In 1985, Sirleaf returned to Liberia and campaigned against Samuel Doe, who declared himself president in 1984. Sirleaf was placed under house arrest. Sirleaf was subsequently given a ten-year prison sentence. She did not serve the full term, however, and she once again returned to Kenya to live in exile. There, she worked again for Citibank as vice president of the African regional office. She also worked as vice president for the HSCB Equator Bank in Washington, DC. Her next major post was as assistant administrator, and later director, of the United Nations Development Program Regional Bureau for Africa. In 1997, Sirleaf returned once more to Liberia, where she ran for president against fourteen other contenders. She came in second in the race, losing out to Charles Taylor. Though Sirleaf was charged with treason for her continuous campaigns against Taylor, she was invited to become head of the Governance Reform Commission after Taylor resigned in 2003. In 2005, Sirleaf again ran for president, this time successfully, and she was inaugurated as the first female president of Liberia on January 16, 2006. Given Liberia's legacy of violence, Sirleaf has often been asked if she feels that female politicians can bring an end to war and genocide. She told Deborah Solomon in an interview for the New York Times Magazine: "A woman would bring an extra dimension to that task--and that's a sensitivity to humankind. It comes from being a mother. But if women had power, they would be more likely to acquire the negative traits that power breeds, like selfishness and territorialism." Still, she added, "it would take a very long term of women absolutely in power to get to the place where they became men." Sirleaf made a similar statement in a Time Online interview and also remarked upon her acceptance as a woman in the role of president of an African nation: "I've been fortunate in that I've been in the professional arena for a while, so accepting me was perhaps easier. At the same time, I'm still very lonely. I'm the only one out there." Sirleaf outlines her political career and experiences in This Child Will Be Great: Memoir of a Remarkable Life by Africa's First Woman President, and a Kirkus Reviews writer called the book "a carefully written memoir of life in Liberia." The writer went on to state that while the book will be "of interest to students of modern Africa, [it is] less well written than Helene Cooper's remarkable memoir ... which addresses some of the same events." Booklist reviewer Vanessa Bush was far more positive in her assessment, calling the memoir "an inspiring inside look at a nation struggling to rebuild itself and the woman now behind those efforts." In addition, a Reference & Research Book News critic found that This Child Will Be Great "gives hope that, with perseverance, we can change the world." Library Journal writer Veronica Arellano noted that Sirleaf's "autobiography is a testament to the remarkable impact of ambition when it is used for public good." Born October 29, 1938, in Monrovia, Liberia; married James Sirleaf, c. 1955 (divorced); children: four sons. Education: Attended the College of West Africa (Monrovia, Liberia), 1948-55; graduated from the University of Colorado; Harvard University, master's degree, 1971. Minister of finance, Liberia, 1972-73; Citibank, Nairobi, Kenya, director, 1983-85, African regional office, vice president, 1980s; HSCB Equator Bank, Washington, DC, vice president, 1980s; United Nations Development Program Regional Bureau for Africa, began as assistant administrator, became director, 1992-97; Governance Reform Commission, Liberia, head, 2003; president of Liberia, 2006--. * This Child Will Be Great: Memoir of a Remarkable Life by Africa's First Woman President, Harper (New York, NY), 2009. Also author, with Francis Nyirjesy, of the report The Outlook for Commercial Bank Lending to Sub-Saharan Africa, World Bank, 1991. 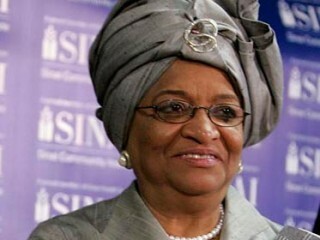 View the full website biography of Ellen Johnson Sirleaf.